S (Scripture): 1 Peter 2:4 Now you are coming to [Jesus] as to a living stone. Even though this stone was rejected by humans, from God’s perspective it is chosen, valuable. 5 You yourselves are being built like living stones into a spiritual temple. You are being made into a holy priesthood to offer up spiritual sacrifices that are acceptable to God through Jesus Christ. 6 Thus it is written in scripture, Look! I am laying a cornerstone in Zion, chosen, valuable. The person who believes in him will never be shamed. 7 So God honors you who believe. For those who refuse to believe, though, the stone the builders tossed aside has become the capstone. 8 This is a stone that makes people stumble and a rock that makes them fall. Because they refuse to believe in the word, they stumble. Indeed, this is the end to which they were appointed. 9 But you are a chosen race, a royal priesthood, a holy nation, a people who are God’s own possession. You have become this people so that you may speak of the wonderful acts of the one who called you out of darkness into his amazing light. 10 Once you weren’t a people, but now you are God’s people. Once you hadn’t received mercy, but now you have received mercy. O (Observation): Peter lets God’s people know that they have hope in Jesus Christ, because Jesus has set them apart for God’s work in the world. Rejection may be part of the results of the work, but they are to press on, since Jesus has already given them mercy to carry on. Many will not believe, but God’s people are to carry on and to share how God brought each of them from darkness into the light. A (Application): At a recent retreat I attended, Pr Mark Hanson – former Presiding Bishop of the ELCA – taught us about “cairns.” A cairn is a human-made pile (or stack) of stones. The purpose of cairns is diverse, but he highlighted this purpose: to mark a significant moment in history. Jacob sets up a pile of rocks when he sees angels ascending and descending in a dream. 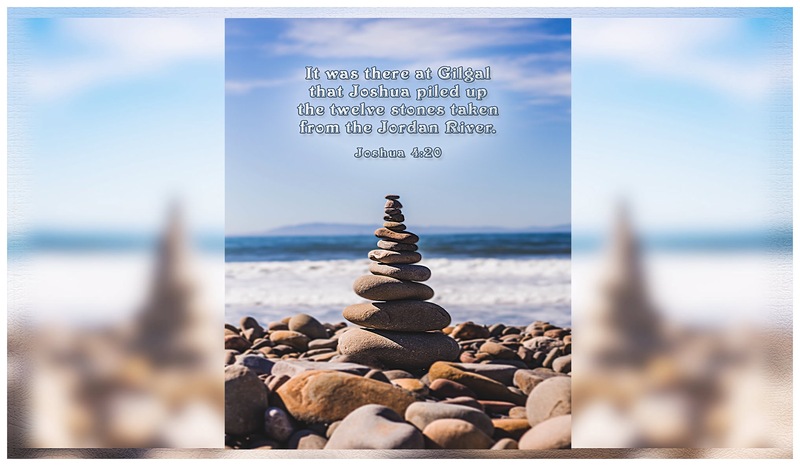 Joshua and crew were instructed to set stones in the middle of the the riverbed of the “temporarily dammed Jordan River” when they crossed into the Promised Land. These cairns mark significant life-giving moments in the history of God’s people. In what seemed like a moment of defeat, a rock was placed in front of a tomb. What was a marker of death became a marker of true life! Seeing a cairn in this light can serve two main purposes: as a memorial, or as a sign pointing to a new future. If seen as a memorial, we lock in the past and focus on nostalgia…a yearning for what was…idealizing an unattainable past. If seen as a sign pointing to the future…we open up some wonderful possibilities! When a cairn is seen as a sign pointing to a new future, we move from simple nostalgia, to memory that builds confidence for the present and future. Looking back in order to look forward. This brings us hope. We can look back and see where we’ve been, and we can look at those markers and see how God was active in our lives. That gives us hope for the present and future. After all, we are LIVING stones. We can share stories of where we’ve been. We can focus on where we are going. We can be the markers for future generations. And so we begin, anew, today! What stories from our past will give us confidence that we can weather the storms of today??? This entry was posted in Digging Daily and tagged Backward, Forward, Hope, Joshua, Living, Stones. Bookmark the permalink.